What did the father of Polemology say about the periodicity of wars ? Does there exist a logic between events that can be applied to understand and anticipate crises and wars? This was not a question of claiming to find a “Law of History”. Rather, put more simply finding an answer this question meant a way to make more reliable forecasts and to try to anticipate crises or wars which appear unforeseeable. All this research came from brainstorming sessions in 1973 on the past, the present and the future. The diagram above was the center of the brainstorming in July-August 1973 and is the origin of all that was discovered. The present is the result of one or more past events. It is the base of the rational analysis to imagine causes and effects. An event in the present has its cause in the past. If it were possible to bind pass present and future events by a logical connection, it would be possible to foresee the future by analyzing the past and/or the present. It was only in 1988 that an intuition on a temporal and statistical logical connection was found. It then took almost 15 years to transform this intuition into a usable model. Now, we have to present the results and make them available for everybody. This will make it possible to launch the open debates necessary for confirming or rejecting various concepts worked out over the years. Can we predict, in an approximate way, a war before the slightest incident early sign ? Yes. It is one of the applications of these studies gathered under the name “Clock of the Unconscious”. This expression “Clock of the unconscious” is debatable as a scientific term but undeniably expresses this phenomenon in a simple and comprehensible manner: a simple, periodic phenomenon which stirs up elements which not currently in the field of consciousness. This will not give you the exact date of these expected events but a time period during which the events are probable. A foreseeable event is never certain but has simply a high probability. The application of this logic resulted some forecasts which were confirmed, as you can judge. It is necessary to consider these concepts explained here as a complement to classical methods which are not described here. Of course, all this remains preliminary. There is still much to do if we want to be more solid and more precise. 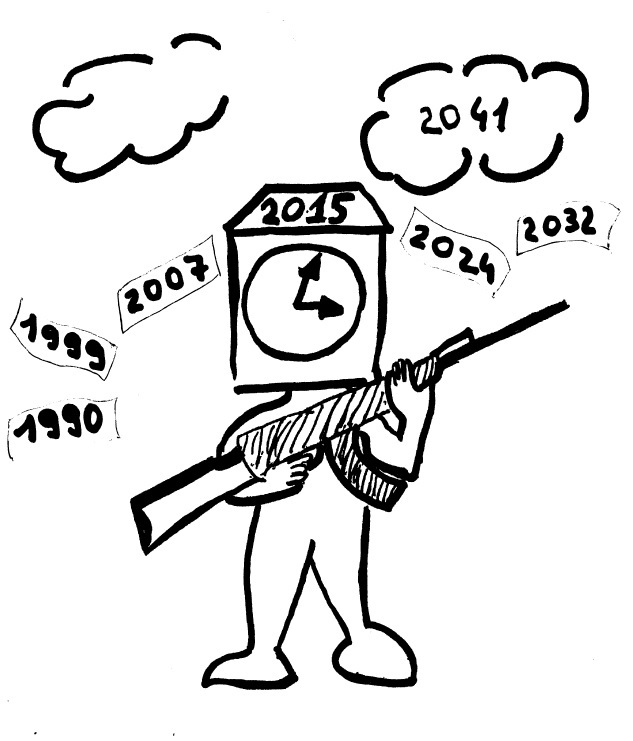 What was foreseen by the Clock of the Unconscious over the period 2014-2017? In compliance with the “War Cycle” (also called “Return Cycle”), the period 2014-2017 was foreseen as one with crisis and risk of war in various areas like Europe, the Middle East, Asia, and a possible world trend. The return of the fall of the Berlin Wall and the end of the blocks of Europe which again promotes blocks and questions the history for 25 years. Was all that invented? There is all the evidences that you want to confirm these results. What should current results be retained? It is necessary to retain this concept of “return of the past” as it makes it possible to revive or delete the last marked event. It is as if History were animated by internal movements which have an unsuspected logic. This phenomenon does not explain all wars. It is simply a factor promoting the wars, under certain conditions. It is not a systematic phenomenon. It is difficult to show and often creates misunderstandings for those who become acquainted with it and expect a “binary” demonstration. We are not in the All or Nothing realm but in the nuanced “YES, but” or NO, but”, depending on whether you are favorable or not there. The defining concepts are shown/known, but there remains still a long way before becoming indisputable. There is no coherent explanation for this periodic phenomenon for the moment. The periodic phenomenon simply is noted, not explained yet. The origin was not identified for the moment. It is a little like if adding to a clock a cycle of a little less than 8 and a half years which marks measurement and whose knowledge makes it possible to evaluate the probability of resurgences of the past hidden in the unconscious one or exacerbated by a periodic phenomenon. The Returns of the Past follow a definite logic. The “Return Theory”, mother of several applications which result from this, indicates that a past event having marked the unconscious can be relived again with a 3085 days cycle (a little less than 8 years and half) give or take 2 years. At the time of this return it can cause a similar or contrary event compared the event of origin. The most frequent number of cycles to observe a revival is 3 = approximately 25 years. Example: The return of the fall of the Berlin Wall (November 1989) and later the disintegration of the USSR which began 25 years later in 2014. This was the year of Ukraine, multiple intimidations, international reaffirmation of Russia including wars of international character. These events were a reaction to the initial event of fall of the Berlin Wall followed by the disintegration of the USSR. This return, started in 2014, should continue over several years, except and compensation awakening of the Russian leaders (what is not yet the case). 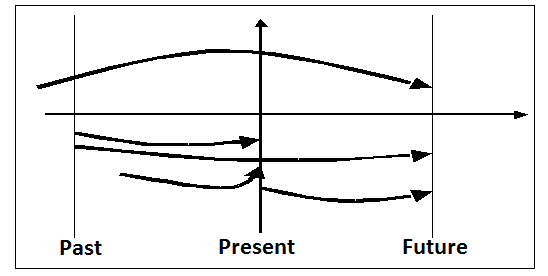 The “War Cycle” (also called “Return Cycle”) is an application of the “Return Theory”. It is a periodic phenomenon with intervals equal to that of the “Return Theory”. It has an absolute anchoring in time. Its T0 is that of the beginning of the First World War. It is a periodic phenomenon which periodically amplifies violences and conflicts at the point of being able to transform them into war or increasing when there is already a war. Combined with a method of identification of the recurring or usual conflicts, it can make it possible to make forecasts of war which as evident in these last years. Modeling the start of the wars. To be able to integrate the data noted in a coherent explanation, it was necessary to propose a model of start of the wars which is described in the part “War Cycle” of this site. The Clock of Unconscious opens multiple ways and could become fundamental in the comprehension of crises and wars. It is a possible intellectual bomb with delayed-action. An insidious manner to shake-up what we think we know, to reinvent of the laws of the History and to revisit the certainty of yesterday regarding war and peace. If it were to be confirmed that certain wars take place only thanks to one periodic phenomenon which passes by, then will it remain of our decision-making power and what we believe while consciously aware? Wouldn’t it be simpler to speak about unconsciousness and its internal Clock beating time? Is this a scientific work? To date, only the principal concepts have been developed and a few studies done to confirm them. They are only upstream studies. To give a final credibility to it, it would be necessary that laboratories and researchers put forth hypotheses that they confirm or reject by complementary work. It is not the case today. It was voluntarily decided to present all this in the simplest form, like a popularization, without dwelling too long on the detail of the data used over the years. More complete data is available but when it is communicated, it is not even examined. The objective in the short or medium term is simply to make it possible to launch a debate, in order to give a path to those who would like to do something of recognition. It is best to take all these similar ideas and concepts trimmed before a more complete research for the day when somebody will be interested in the subject.